A potted garden is a community of plants which grows and changes over time. Autumn is the best time to construct a “four season potted garden” which will look great from September through the autumn, winter, spring, and into the following summer. Plants chosen for this garden must be interesting and beautiful over a long period of time, stand up to winter weather, and grow well together. I generally use violas in these pots designed to look good all winter. They begin to finish as the weather warms in May, and will be pulled out, and replaced with a summer annual. Early spring bulbs are an important part of the show because they break ground and bloom in late winter, and give a very long season of bloom. This potted garden, constructed for the This Century Art Gallery and Williamsburg Art Center, is a collaboration with The Ulster American Homestead Garden Center. 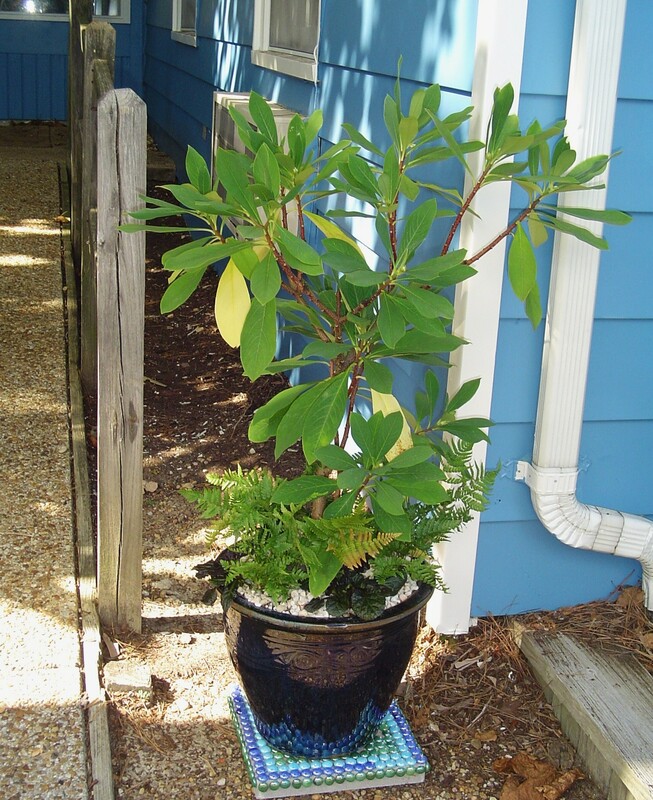 The Patton family donated the beautiful blue ceramic pot and all of the plants. Dustin helped select the pots and plants, and I designed and constructed the garden. This collaboration began last Tuesday, when I visited the gallery’s new Westover Avenue location. The community has worked with the gallery staff to outfit an outreach location where classes are offered, exhibits hung, and all sorts of community activities are hosted. Kerry Mellette, Executive Director of the This Century Art Gallery, hosted a group from our neighborhood. Several neighbors and friends are on the gallery Board. A wonderful group of artists, who meet each week to paint in our community center, are closely involved with the gallery, and two of their members also joined us on Tuesday morning. 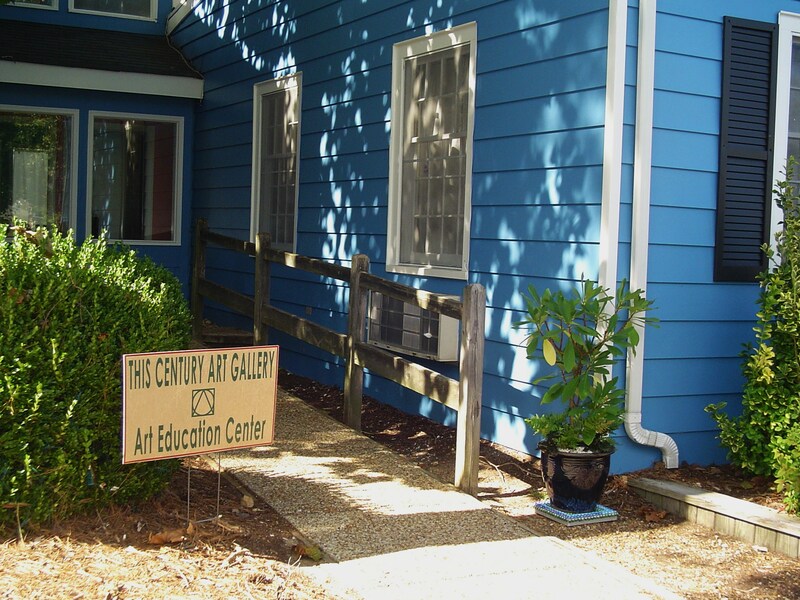 The painter was just finishing up a new coat of blue paint on the Art Education Center building as my friends and I arrived; but something was missing: no beautiful pot of flowers near the entrance. After the program, I asked Kerry whether she had a gardener ready to add plants to the front entrance. We went outside together and looked at the space. Since September is Arts Month in Williamsburg, and lots of events are planned, it is the perfect time to install something beautiful and welcoming by the front walk. Gardeners, craftsmen, artists, architects, sculptors, writers, and musicians have so much in common. We love form, color, harmony, and flow. We find ways to help beauty manifest in the world. We want to communicate through our medium, and perhaps touch another’s life, even if for only a moment. Think of Monet’s gardens- on and off his canvasses. And the beautiful flowers brought to life by Georgia O’Keefe. Handel’s Water Music, and the amazing glass gardens blown by Dale Chihuly. And so, thanks to a collaboration with The Homestead Garden Center, This Century Art Gallery will have a four season pot to enjoy by their entrance, and it will continue to evolve and change as the seasons unfold. 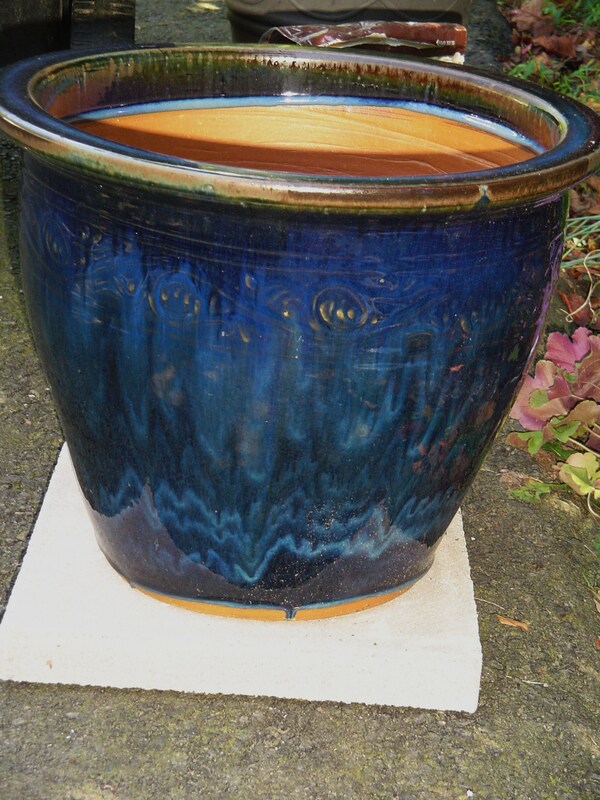 To make such a garden for yourself, begin with a very large pot. 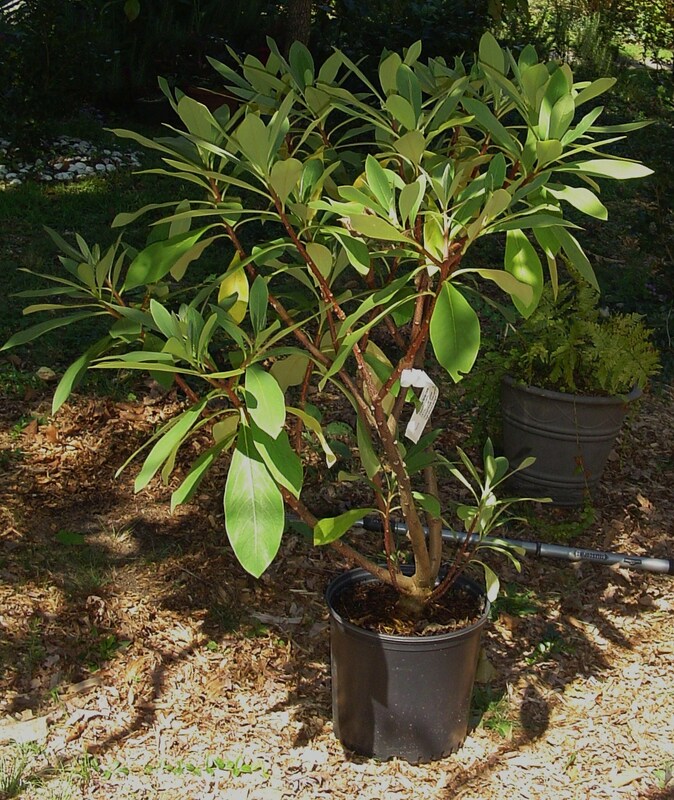 A 20” pot or larger is needed, since the planting is anchored by a shrub. Dustin donated the largest ceramic pot in stock at Homestead for this planting. 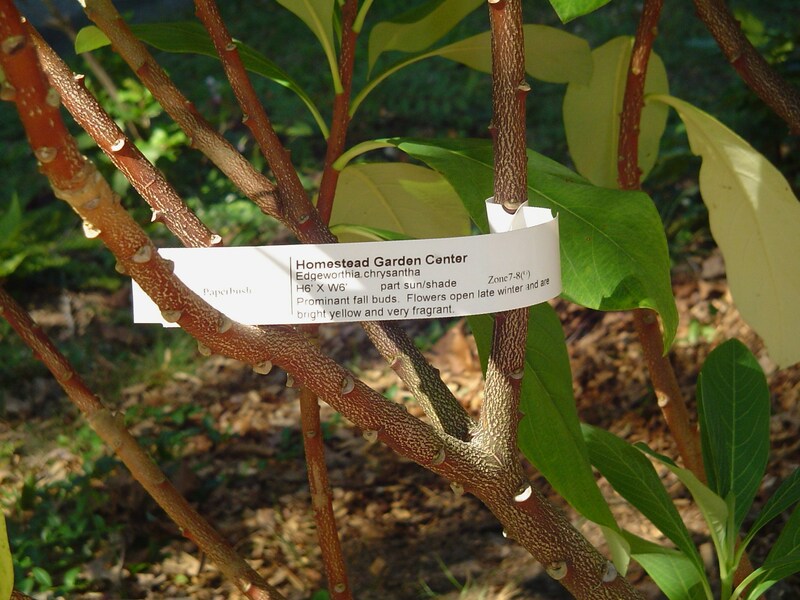 The shrub we chose is Edgeworthia chrysantha. At the moment, it has large oval leaves, just beginning to turn golden yellow, and the beginning of its flower buds. This shrub is most beautiful in late winter and early spring, when its yellow blooms fill the garden with fragrance. This is one of earliest shrubs to bloom each spring, and is simply elegant in form before its leaves emerge. It can grow to 6’ tall and wide in shade or partial sun. 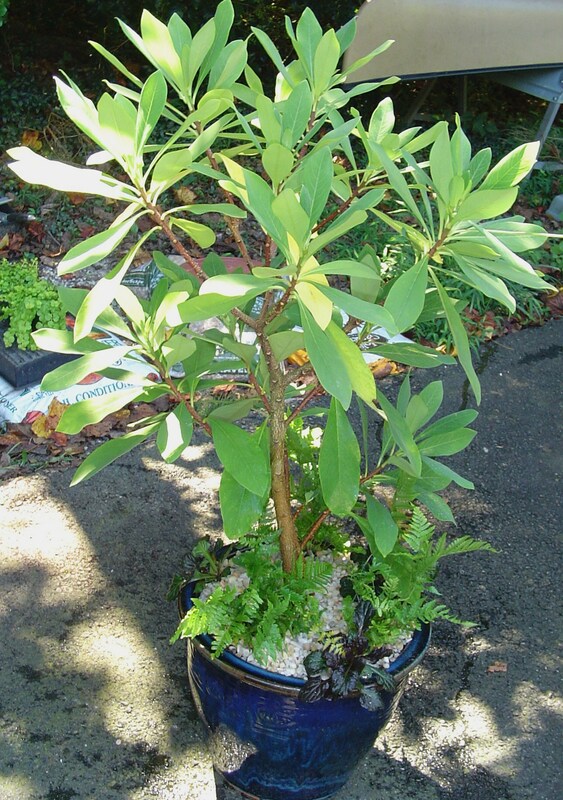 A four season pot can be built around an evergreen or deciduous shrub. A spring blooming deciduous shrub gives a little more excitement and activity to the garden, but evergreen shrubs, like Arborvitae, Osmanthus, or holly are also lovely. 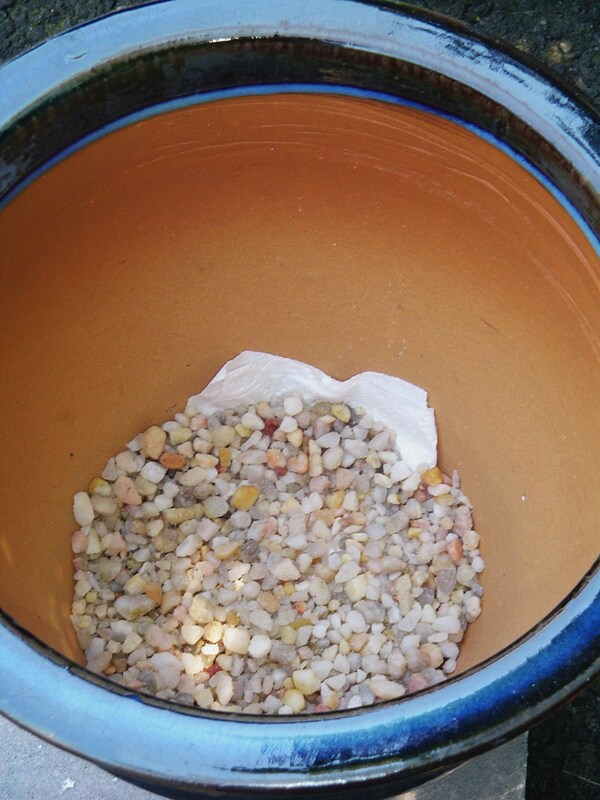 After screening the holes in the bottom of your pot with landscape fabric, wire mesh, or paper towel, add a shallow layer of gravel to hold the screening material in place. Fill the pot ½ to 2/3 full with a good quality peat based potting mix, and add Plant Tone according to the package directions for your sized pot. This will increase the fertility of the soil over the many months your garden will live in the pot. 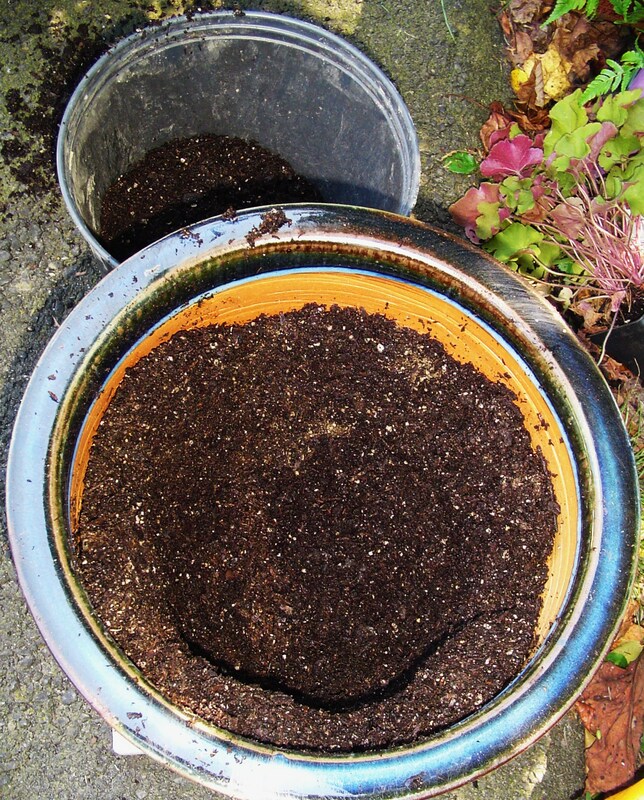 Mix the fertilizer into the soil, and then move about a third of the potting mix back into another container. Press the potting soil up against the sides of the pot. 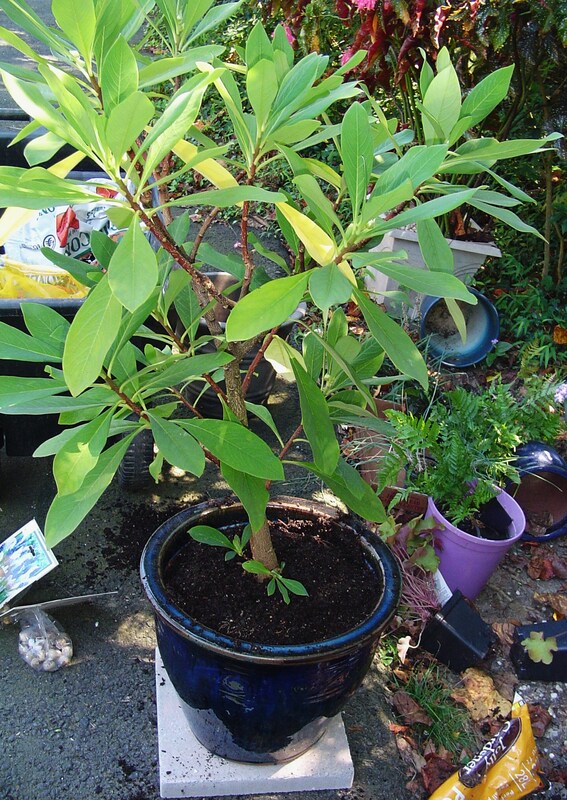 Adjust the level of soil in the bottom so the shrub’s root ball sits at the right height in the pot. Press the remaining soil up the sides of the pot, leaving a shallow layer in the bottom. 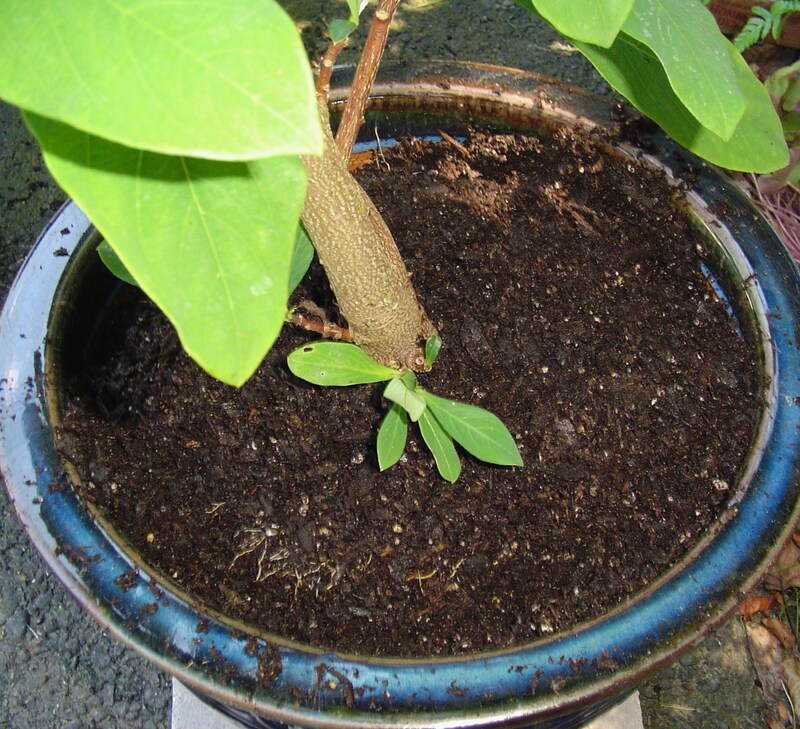 Remove the shrub from its pot and inspect the root ball. Inspect the roots. Remove the outer layer of roots if the plant is rootbound. This one is fine, so I simply loosened the roots with the tip of my knife. The most current advice I’ve read is to slice off the outer inch or so of roots all around the root ball, especially if the plant is pot bound and the roots have begun to grow in a circle around the pot. 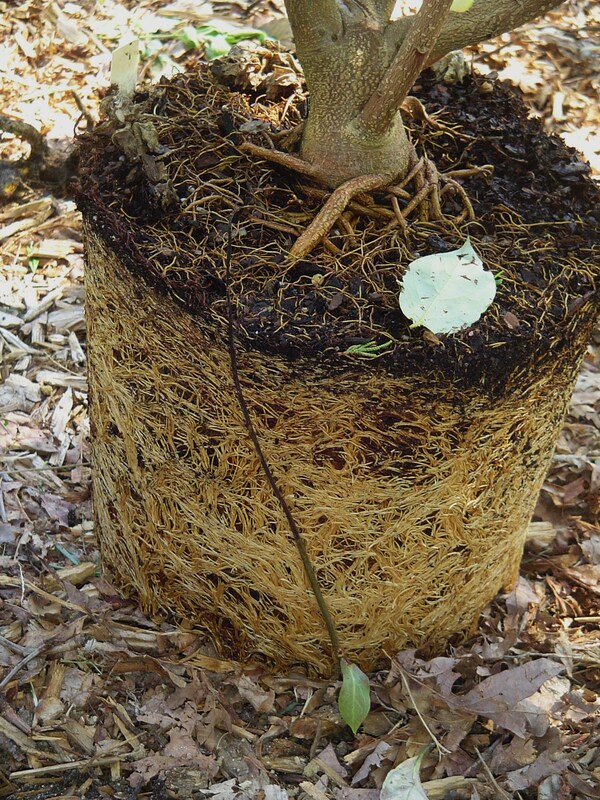 Roots growing around the plant in a circle can eventually “girdle” the plant, limiting new growth. My shrub isn’t pot bound, but I did use the tip of my pocket knife to loosen the root tips and lift them away from the root ball on the sides and bottom. This will help encourage them to grow into the new soil. If the fit is tight, a little of the root ball can be sliced away to make more room for the plants you will add to the pot garden. Place the loosened root ball into the pot, and check for fit. The top of the roots must be at least an inch below the rim of the pot, but not more than 2”. Adjust the soil in the bottom as needed to get the right height, using the soil with Plant Tone mixed in. Add a little soil on the sides of the root ball, as needed, to bring the soil level up to about 8” from the rim of the pot. The pot is now ready for adding ferns, annuals, or perennials around the outside of the shrub’s root ball. This is where we begin adding spring flowering bulbs to the garden. Choose a variety of bulbs to extend the season of bloom over several months. The largest bulbs, like daffodils, will be planted the deepest. Check the planting instructions on the bulbs you choose to determine in what order you will plant them. The bulbs have been planted, and soil added up to the level of the root ball. I planted daffodils between the root ball and the side of the pot, spaced about every 6”, all around the perimeter of the pot. After adding soil, I planted snowdrops (at 5” deep), grape hyacinths (4” deep), and crocuses (3” deep) in the remaining spaces. Small shallow bulbs, like Crocuses, Fritillarias, Oxalis, etc. can even be planted into the root ball of the shrub. Use the knife blade, or a dowel, to drill a tiny hole to the correct depth, push the bulb into place, and cover over with potting soil. After topping off the bulbs loosely with more fertilized potting soil, I planted small starts of Autumn Fern (2” pots) and Ajuga. Several Ajuga come together in a 4” pot. These can be separated, the soil shaken off of the roots, and the roots planted into small holes between the ferns. Autumn Fern is evergreen, and will look good throughout the winter. Its new bronze growth will look especially beautiful against the other plants. Autumn Fern and Ajuga finish the planting for now. Violas will be added when they are ready in a few weeks. Other plants which work extremely well in this sort of planting are Heuchera, Dianthus, Ivy and Creeping Jenny. Heuchera will look good all winter and will continue to grow. They will often bloom in late February, and on into the summer. Their leaves are very bright and colorful all winter long. Although I’d planned to use H. “Georgia Peach” in this planting, there simply wasn’t room for the roots. When constructing a potted garden with bulbs, keep in mind the biomass which will grow by spring. Most bulbs have large root systems, and all of the other plants will grow larger during the season as well. The four season garden is finished off with a generous sprinkling of Osmocote, which will feed the plants every time the planter is watered for four months. Another sprinkling will be needed in late January to fuel the plants’ growth for spring. Finally, a top dressing of pea gravel will protect the roots, prevent rain from splashing soil up onto the leaves, and will discourage hungry squirrels from digging. I also like to place large rocks on top of the gravel for added interest. Care must be taken to place these away from where the smaller bulbs are planted. Water well, place the pot in a shady spot, and allow everything to settle for a day or so. When this garden is installed at the gallery, it will sit on top of a specially made plant stand. This not only adds a finishing touch visually, but it will keep the pot off of the soil and prevent the Edgeworthia’s roots from growing into the ground under the pot. 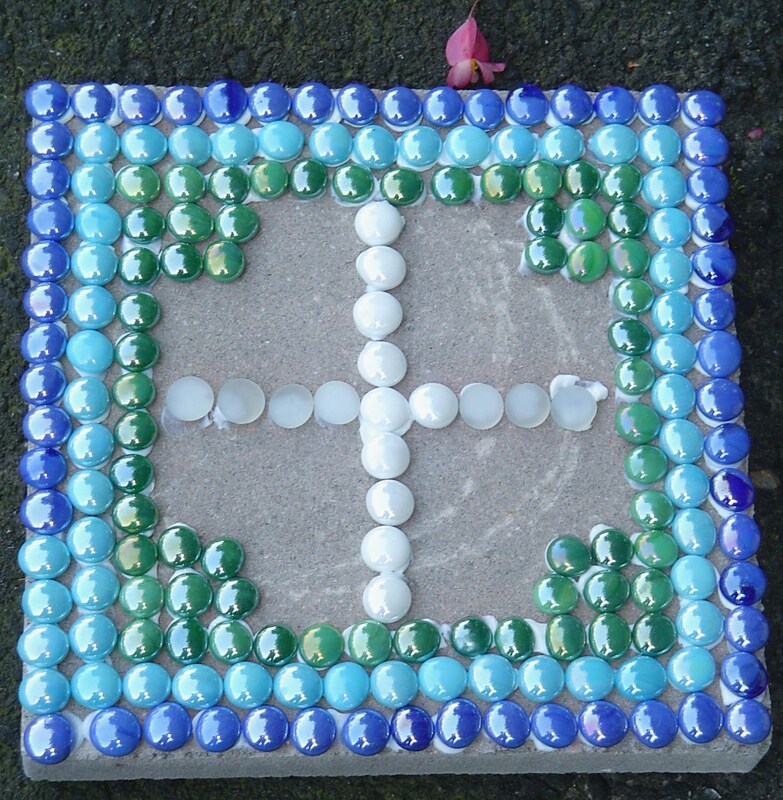 The stand is made from a 14”x14” square concrete stepping stone. I’ve glued glass pebbles onto the stone in a decorative pattern around the edges so the pot will sit up on the glass pebbles and there is space for water to drain when it rains. The four season pot will look beautiful year round, even in the coldest months of winter. By the time the bulbs finish, the Ajuga will be spreading. It will bloom with beautiful blue flowers on tiny stalks, much like the grape hyacinths it will follow. The Ajuga will fill in to make a dense, beautiful ground cover throughout summer. 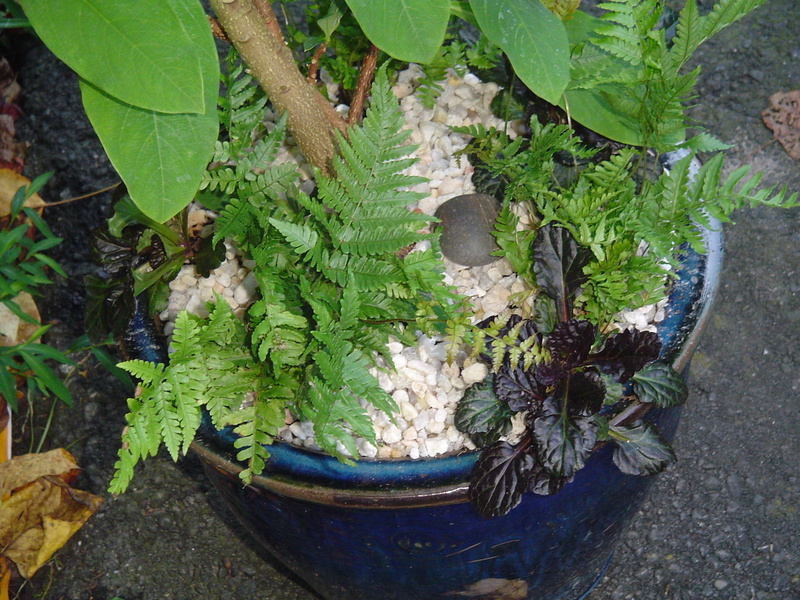 As the ferns grow, the fronds will spill over the rim of the pot to soften it. This planting can stay in place indefinitely with only regular watering and occasional feeding.